> Kaweco Aluminum Sport Blue Jeans Bal. 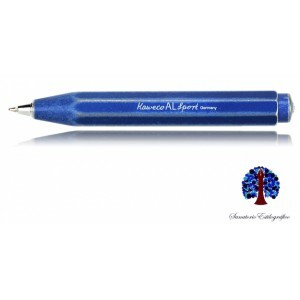 Kaweco Aluminum Sport Blue Jeans Bal. Kaweco ballpoint pen finished in matt blue jeans aluminum. Kaweco extraordinary solid aluminum ball pen. Robust weight. Anodized surface and laser engraving. Push button mechanism. Classic chrome clip included.